This easy recipe for dill potatoes is very nostalgic for me. 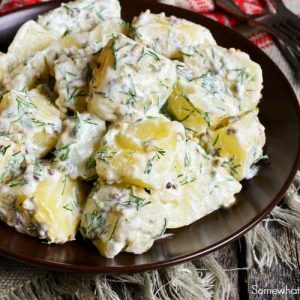 Growing up my dad would always use dill when making these delicious and creamy dill potatoes for dinner. These potatoes are so versatile and can be used for dinner, a BBQ with friends or for an afternoon snack. In a large pot on high heat, boil the potatoes in water until tender, about 15-17 minutes. Drain, return the potatoes to the pot and set aside. Microwave the cream cheese and milk in microwaveable bowl for 1 minute. Stir until smooth. Pour the cream cheese mixture over the potatoes, then sprinkle with dill.